Dirigiri are an awesome old school death/thrash band that any fan of metal the way should sound and here is an interview with Omar. Tell me how the band formed and what is the present line-up and did you go through a lot of line-up changes to get to the current on. Omar: The band was formed by Gene Olivarri looking in a local publication looking for a drummer I had posted and add looking for a punk band. He responded with what's wrong you don't like metal, I responded yes I do but finding real players in this town is far and few between. Gene: Present line up Myself on Guitars and Omar Guerra Drums,Derek Dishner vocals, Raven outlaw Bass. Omar:This has been the same line up for almost Ten years. What were some of the first practices like? Was it kinda like a feeling out process? Gene: The chemistry was there as soon as we walked into the room,our first jam and we wrote 4 songs in about 2 hours. The feeling out process was for Singers and Bassists. How long had the band been together before you decide to start to write original songs and how hard or easy was it come up with songs? Omar: We started writing original material immediately that was the goal of being original being ourselves. Gene: Not very hard at all the rhythms are our foundation we built around them . Omar: It was just a matter of getting together. Tell me how the process of a song coming together and how many members are involved in that process? Gene: Just 2 Omar and I, we are the process. The next album, the bassist and vocalist asked about it and I said its already been written. Now at what point did you decide on a name and who picked it out and how did it come about? Omar: At the beginning we started with the name process, I found the name Dirge and added an ri at the end then later changed it all I's. Tell me about your 1st live show. Where was it at and what was your set list like and were you nervous at all before hitting the stage? Omar: it was at the Famous Taco Land in San Antonio Texas we opened for Las puses oops cruces lol sorry guys, the club was packed out the door, we tore it up so rowdy that you could hear a pin drop people were not excepting such a performance from a four piece band like us. Anos de satanico's, Hymns of death, The draining, Burn at the stake, Holy perversion, The bleeding. These six songs were our set list then. Not nervous more eager to hit the stage than anything else. How would you rate yourselves as a live band and are there any videos floating around on Youtube . Gene: Now at the present i would say a TEN.!!!!!!!!!! Omar: Just Songs of the present E.P our professional videos will up soon. Now at what point did you decide to go into the studio to record some songs? What studio did you record at and how was it? 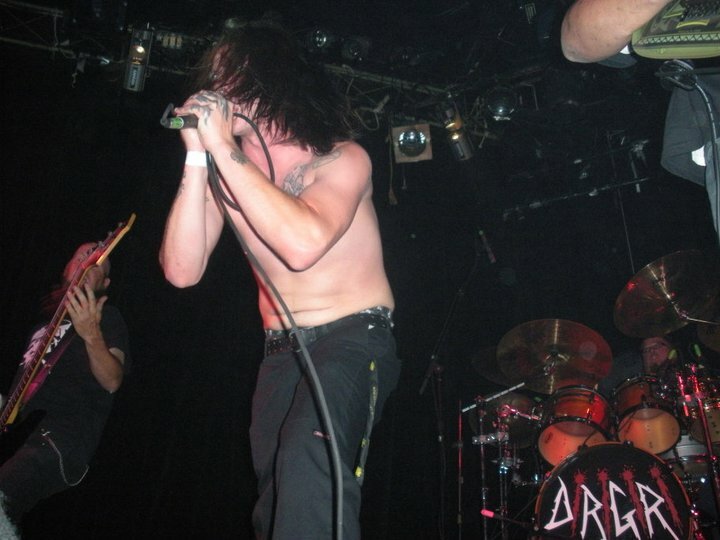 Omar: we did a Demo called the live loud hymns of death demo , back in 2005. Gene : its was a live recording done in corpus Christi Texas with some dude who offered to record us Moses was his name. Now that the release has been out for a bit, what are your thoughts on it these days? Omar: very happy with the response and the production that Dennis Munoz of (Solstice) DNR studios did he rocks!!!!! Gene: I feel that its very exciting that our music will get to new ears all over the world. Now the release I have, is that your only release so far or are there others? For someone who has never heard the band, how would you describe the music? Gene: Its very distinctive to where it can be enjoyed by anyone ,Raw naturally Heavy catchy to the point of you put your PC or CD player on repeat. Since the release of the CD, have you done many live shows? Omar: we have been extremely Busy, now we are preparing for this spring and summer tours with Thrash or Die, Anger, and Trust No One. How has the response to the CD been so far and when we expect some new music? Gene: response's have widely accepted and positive from all over the underground and also the world its becoming a phenomenon. How do you guys go about promoting your music? Omar:By Social Media in all forms, word of mouth , flyer's, Radio and Magazine's. What is the best thing and worst thing about being in a band? Gene: The best thing would be the feeling of accomplishment being in front of all you fans showing live what you have created from you heart and soul. The worst thing is when production company's or promoters our booking agents run off with your money instead of paying you when they know you have to get to the next town. What do you parents think of the band. Gene: My Mom loves it and is very proud of such a talent I have become,and has always pushed me to be a success. Omar: I'm sure my Dad would be proud, my Mother enjoys our live performances shes say I make allot of funny faces while playing lol. Gene:To be successful and accomplish our goals we have set out to do. Omar: I just want the band to get what it deserves for all the hard work blood sweat and tears for getting ripped off and being under paid its very hard to be a working band very many obstacles to over come you just have to lift yourselves up and keep on. Do you think that Cd's are gonna eventually fade away like cassettes did? Omar: more than likely but heaving a physical product is a must Cd's cassette, vinyl's. Even live performance's may become out of style cause people don't come out to shows because this is the Internet age. Where do you see the underground in 5 years? Gene: maybe doors will open from the underground to where bands get to exposed to the average joe. What are some of your favorite bands and favorite concerts you have seen so far? Gene: thats a hard question,the best show I have been to was when megadeth , testament and judaspreist in 1991 played at the hemisfair arena where the best team in the NBA use to play THE SAN ANTONIO SPURS!!! Omar: The best show for me was getting to share the stage with Onslaught and Evil Mpire last year That was Dream acomplished. If you were trapped on an island and were allowed 10 cds, which releases would you get? Gene: Repulsion -Horrified, UFO-phenomenon, The who -quadrfinia, anything and everything of Autopsy, Malevolent Creation -Ten Commandments/Retribution albums, Merciful Fate-don't break the oath, Kreator-extreme aggression, Venom-welcome to hell, Celtic Frost -Morbid Tales. Plug any websites and/or merchandise you have for sale. visit http://www.hellsheadbangers.com/ pick up your copy of DiRiGiRi self titled E.P today!!! Thanks to Chris Forbes for pushing us out to the Masses !! Keep it Metal! !